WASHINGTON: South Asia is among a few regions in the world where nuclear weapons could be used in a regional conflict, the outgoing US Vice President Joe Biden warned on Saturday. In a recent speech at the Carnegie Endowment for International Peace, Washington, Mr Biden hoped that the incoming Trump administration would continue America’s leading role in reducing nuclear weapons around the globe. “Not just North Korea, but Russia, Pakistan, and others have made counterproductive moves that only increase the risk that nuclear weapons could be used in a regional conflict in Europe, South Asia, or East Asia,” he said. Mr Biden urged Republican and Democratic lawmakers in the US Congress to rise above party politics and deal with the nuclear issue with the seriousness it deserves. “Nuclear security is too important to be a party policy, for our nation and for the world. Although we no longer live in the daily dread of nuclear confrontation, the dangers we face today require a bipartisan spirit,” he said. “The challenge is looming on the horizon. While the vast majority of international community understands that the world is more dangerous when more nations and people wield nuclear weapons, there are still those who seek to grow their arsenals and develop new types of nuclear weapons,” he warned before naming Pakistan among the nations that were doing so. Pakistan also has warned against the dangers of a nuclear conflict in South Asia and wants the international community, particularly the United States, to help resolves its tensions with India. Pakistani diplomats in Washington also referred to a recent statement by the Indian army chief, General Bipin Rawat, who publicly confirmed last week that India did have a Cold Start doctrine. Gen Rawat is the first senior Indian official to do so. Previous Indian chiefs avoided using the term Cold Start and preferred calling it a “proactive strategy”. Cold Start is the Indian operational plan for launching ground and air strikes inside Pakistan before its defensive formations launch a counter-offensive. The Indian media described Gen Rawat’s acknowledgment of a Cold Start doctrine, in an interview to India Today, as a radical departure from New Delhi’s previous policy and intended to send a message to Pakistan. Pakistan says it would counter the Indian move by relocating defensive formations close to the Indian border, and warned that it would be forced to use “tactical nuclear weapons” if India ever launched cross-border attacks. Tactical weapons are usually delivered by short-range ballistic missiles and could effectively counter a Cold Start strike. The Pakistanis also welcome international mediation for resolving this and other disputes —particularly Kashmir — with India and warn that ignoring these issues could lead to yet another war between South Asia’s two nuclear-armed nations. The Indians, however, oppose any outside intervention in their disputes with Pakistan, insisting that such disputes should only be discussed in bilateral meetings. But bilateral talks too have failed to produce any results and are rare. India also says that terrorism is a greater threat to peace in South Asia than any other disputes and accuses Pakistan of continuing to encourage cross-border terrorist attacks. Terrorism is one issue in which India welcomes outside intervention and wants the international community to use its influence to stop the alleged cross-border terrorist activities. Pakistan dismisses these charges as part of an Indian propaganda campaign to malign Islamabad. 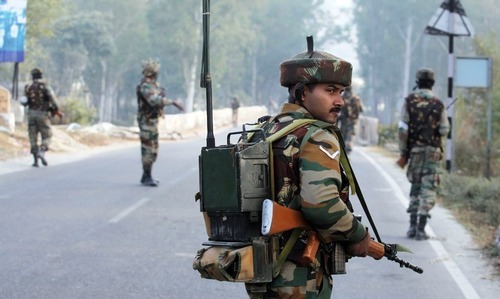 Has India’s army revived its ‘Cold Start’ doctrine? Power should come with maturity and responsibility. Unfortunately few countries don't have either maturity or responsibility but have power. Needless to say there are other bigger players to provoke these small countries to test depth. who invented them and used them first Mr Baiden??? you saying all this now?? after 8 years?? The days of a weak India falling in line to the US or other powers is long gone. India's GDP is third in terms of PPP even nominally it's ahead of countries like Russia. All are talking good now but while in office did very little to reduce tension between India & Pakistan. Nuclear weapons of both India and Pakistan will never be used as they are the deterrence for peace reasons and scare balance to stay away from nuclear or even big conventional war.In general peace will prevail in south Asia.No one is that mad to jump into total self annihilation. India and Pakistan may be two countries, but the populations are just next door neighbours. They know that radiation kills ten times or ever more than the blast even when the winds blow from west to east. We are surely expecting no nuclear war in south Asia. They have couple of time dependent resolvable issues, but certainly not worth a nuclear war between people of the same stock or blood.In the hearts, Indians and Paks have thousands of years of mutual love history. Look at them in Canada and Europe living as same mutual loving people. Let us be sure that there will be no big war in south Asia, and let the forbidden use of nukes, which will never ever- far beyond for ever be used. Indian government's hyppcrisy: On one hand India miserably attempts to involve other countries by asking them to avoid and isolate Pakistan, on the other hand India refuses to accept Pakistan's view of international mediators helping resolve outstanding issues. India wants to involve other countries for its propaganda to malign Pakistan but doesn't want the very same countries to mediate our problems and doesn't want these countries to actually come to the ground and actually see for themselves the brutalities in Indian Occupied Kashmir. This cancer requires treatment once for all , so , apply medicine irrespective of any out come. America and EU must put sanctions on China as she is increasing nuclear weapons race in Asia. Then resolve Kashmir issue, the core reason of conflict between 2 nuclear armed countries in South Asia. statements are easy. diplomacy is harder. Peace only comes when cool mind prevails. India introduced nuclear weapons in South Asia. First USA should clear all debt outstanding then boast about nuclear weapons. Yes indeed, it is a serious concern. Now India might get NSG entry and access to more nuclear material. That might compel Pakistan to somehow compensate its requirements as well. But the key problem is Kashmir dispute. Once Kashmir problem is solved, there should not be any reason for these two countries to spend so much time and money on nuclear weapons. Mr Biden, state cause of Pakistan's moves. It's the kashmir occupation by india. Remove the cause, the consequence disappear. Don't harp on consequence while ignoring the cause. @jamil ahmed ..and NSG was set up after India deceived the world by clandestinely blowing Nucleuar devices. @KT US debt is in US currency. Who runs currency- that is king. Dont think of US debt as traditional borrowing where someone pleads or asks for money from someone else. Think - does your bank plead you to keep your money with them ??? You have no option but to keep your money in some or other bank and u want to keep it in biggest safest bank. Same is nature of Chinese deposits in US treasuries - biggest and safest . China should be more worried what if US refuses to honor committments. I do not see any use of Nuclear Options by South Asian countries as long as teritorial integriry is mutually respected. The Nuclear arm race in South Asia was first teiggerred by India when it first initiated nuclear test. Both India and Pakistan have not signed NPT treaty and therefore are not subject to comprehensive IAEA control and monotoring obligations. It is sad that overwhelming majority of peace loving people both sides always aspiring for a friendly neighborly relation and peaceful co-existence been kept under shadow of long unabated fear and anguish of war. I still hope and trust that both sides civilian leadership will comprehend the mass destruction of innocent human lives and property, with rolling impact for generations, if nuclear or non-nuclear major war is forced upon the helpless people who have always longed to live with peace and amity. A true leadership would value even a single innocent human life and peace of their people like of own family member/s instead of plunging them into destruction and annihilation of war. We love US .....our All Weather Iron Friend !! Long Live US INDIA friendship !! @LOGICALLY CORRECT ....What happened to Russia suddenly? @jamil ahmed It was China who introduced nukes in this region. Don't you have even such basic knowledge? The world should unite against china to stop sharing nuclear technology. India should lead the front to denuclearlize this region, starting from China. @Foreman "What happened to Russia suddenly?" RUSSIA is our TWIN BROTHER ! All nuclear weapon powers must be made to give a solemn declaration in the UN that they will not initiate first use. Once done no one with or without those weapons will feel threatened. I hope Pakistanis don't see that as a bargaining chip. In this madness, death and destruction will be for both. @saif Sorry. It's India which has caused all this in South Asia. @Rah Disagree. India is the root cause of all problems in this region. @jamil ahmed : China introduced Nuclear arms race in Asia. Get your facts correct. Kashmir conflict, water treaty and exit of Mr. Modi will solve the entire problem, Mr. Biden. You are being India's mouth piece. @jamil ahmed Its China get the facts, tested nuclear bomb in 1964.And China is a major threat to India. @R k hastir . usa is a threat to humanity. Who listen to you outgoing Biden. Better keep shut and first see who introduced nuclear weapons in S. Asia.... India and that too after getting Nuclear technology from Canada for peaceful purposes. Finger firmly pointed at china. @Jamil Ahmad Do you know China also come in Asia? Why two standards of opinions? @Re why China bother about poor country like india, or nepal or Bangladesh. No one care. @saif, not practical, China is amongst the best peaceful countries of the world, 75% of the world rely on business with China, not a single country boost non availability of a Chinese product in their country. Sanctions can only work on isolated countries not like China. UN and world powers are responsible for not solving the problems like Gilbralter, Diego Garcia, Falkland, Kashmir, Palestine and many more. "Pakistan will not tolerate India's 'hegemony' in region, says Sartaj Aziz", A clear indications indeed. @ FOREWARNED poor Russians. What an ugly twin! India is growing Global superpower,we need to educate and make skilled pakistan to compete with India. @Mandy don't let me spoil your make believe world. Stay in it. Reality is too harsh to bear for you all. @Saif zulfiqar forget others, Kashmir and Palistine are oldest Uan resolutions in security council. The focus should be on them. It's the K world for 'kashmir'. The key to solving all problems of the region. Rest is waste of time. @ANT hahahahaha. And the debt of $500 bn is no 1 in the world ahead of every other country. Btw annual deficit is $150bn. Bad days ahead. But self denial helps on hungry stomach. Very sad. Our future generation is exposed to great risk. @ANT But still half of India lives in slums. USA will have to adopt policy based on facts to contribute t peace in South Asia rather than favoring one country over the other. @farid Think beyond poverty/slums...you are not doing any good to yourself or to you country by sticking to one aspect. “Not just North Korea, but Russia, Pakistan, and others have made counterproductive moves"
Who are these "Others" in your comment Mr. Biden? Afraid to make your biggest weapons buyer, India, unhappy. And what about Trump's tweets about the nuclear arms race between Russia and USA. Wasn't this counterproductive? @saif - Mr Saif, its Indians who are suffering in this fever, check one more time before commenting. If India and Pakistan will engage in nuclear war, the responsible will be UNO, USA, USSSR and even China for not resolving the issue of Kashmir between the two countries for the last 70 years. Once Kashmir issue solve amicably, I believe both the countries can live like a good neighbour. But so far no super power and UNO show any interest to play a key role. One is against any kind of war as dialogue is the lone solution to solve problems. Neither India nor Pakistan can finish each other from the earth, so, the leaderships and people who wants peace in sub-continent should raise the pressure on both the states to solve such issue once for all. This is the region where half of the world's nuclear powers border each other and one of them has territorial disputes with two others. Only Russia is not involved in any active territorial dispute with a nuclear neighbor. Last but not the least, one of the nuclear powers was carved out of another. Maybe Biden is correct but he and 'them' forget that their pet-the settlers have are threatened to use these weapons. Progress. Real Progress in any field namely science, diplomacy etc, can only be achieved if the motives to achieve them are universal. Since we are now more self-centered as individuals or groups on the premises that we are self-contained. This is also triggered by the fact that we are all getting deficient on Trust. The most critical and delicate thing in the world is Trust. Unless we as a society appreciate and cultivate the force of trust the destruction is imminent. Modi's brain works similar to Afghans' or it is the other way,in any case both are working in unison.Listen carefully what Mr.Biden says. Expecting from other nations to follow the path of peace and reduce the arsenals where, USA is still leadding in possesing the number of war heads. @ANT My friend, GDP alone do not make a country invincible. Go back a little in history and see when Soviet Union collapsed what was the recorded GDP and where the USSR ranked in world then. You will realize the truth. GDP has to be viewed alongwith income distribution, literacy level, demographics, HR capital and only then you can depict the might of a nation. As for Biden's statement, I would rather disregard this and rather focus on what the new administration has in store to offer. Ironically, when it comes to using power responsibly, even USA doesn't have a good track record there. @ Masood Hussain You are wrong. How can something work if it doesn't exist. @Zak China has external debt of about $28 trillions. Beat that. @saif What world you live in? Before making such a statement, did you bothered to look at the who is the biggest bilateral trade partner for US and EU. You really think such a strategy would work. And for your other argument blaming China for accelerating weapons race in the region, have you cared to find out what business US has in the region. If at all this is of discussion, it is something for the very countries present in the region (including China). @Rah Get your facts right. It was India who made the first nuclear test in Rajahstan thereby starting the nuclear arms race in South Asia. As for China, it conducted its nuclear test in 1964 at the backdrop of Taiwan Crisis against an imminent US nuclear threat. Now US is using India to ensure they have someone to counter Chinese dominance in the region and India (just like Pakistan in the days of Russian invasion of Afghanistan) thinks they have the muscle to take on China. When the time comes, history will repeat itself and India (just like Pakistan) will realize that US was just a fair weather friend. India at that time will be standing alone in the region with all major regional powers on one side. India should ignore the fact that historically it was Pakistan and hence the same thing will not happen with them. History has a very bitter way of repeating itself. Fully agree with Syed Hassan . India and Pakistan should never use nuclear weapons against each other. Please US get rid of nuclear weapons first and then ask others to follow suit. What a hypocrite! I sometimes feel that Western societies are kind of "hoping" that South Asia uses nuclear weapons. They feel the decline and scarmbling and electing leaders like Trump and other hardliners in Europe. South Asians please wake up and resolve your deferrencea peacefully. A wishful thinking by a very worried person! @jaywa forego a bad characteristic of lieing. US has highest debt of $2 trillion, but it's super power. China has minuscule seasonal cycle debt and a cash reserve of $4 trillion. India, well, I don't want to bust the false bubble of some otherwise they will become suicidal if confronted with reality. @ Masood Hussain but in the end both come begging pakistan for help. @Logically correct....they only use you and the rest of the world. Its not friendship. You should differentiate between water and toilet paper. @maverik i agree. india must allow UN to work in indian administrated kashmir just like pakistan. @ANT ...Your GDP is just enough to manage your over populated country so stop boasting and comparing yourself with advanced nations like Russia etc. @Zak ..Awsome reply Zak,bravo mate. @Zak China has debt of $ 4.2 trillion . Their debt to GDP ratio is 42% . @Zak " US has highest debt of $2 trillion, but it's super power. China has minuscule seasonal cycle debt and a cash reserve of $4 trillion." Seasonal Cycle Debt !!?? All these figures and terminology have yet to appear in any book ...sounds impressing but !! Everyone want to keep his home safe and secure from threats. When brothers kill each other, the rest of the world sells them weapons. All Pakistani friends have become experts in predicting the future of the world in particular about India its demise. Great experts but never wanted to look inwards. @LOGICALLY CORRECT Ever heard the term 'Fair Weather Friends'? Take a close look on history of friends. Often friends change just like weather. US should take the first step and get rid of all WMD's it has in its possession. @taha "statements are easy. diplomacy is harder. Peace only comes when cool mind prevails." And it is because of the hegemonic designs India have for its power game. On the other hand Pakistan has been struggling for normalisation of relation and peace. @isarivelan Do not take it the wrong way my friend. What your Pakistani friends are telling you that you learn from their experience. Much of our problems today roots back to the Afghan War era. We as a nation are paying a price for fighting someone else's war. India is now being used by US as well for the same cause. Of course its for India to decide. It is a theory which western leaders want to play with. India and Pakistan is smart enough not to use nuke Their arsenals at all as the result will be wipout their heritage which are bonded in a same thread. Nuclear weapons are good deterrent. So, it is useless for real war. @ANT i dont think its just about the economy,india dont have the will power needed for standing in global or even regional powers. Mr Biden do you even know who invented these weapons and then also the only country in the history that have used these lethal weapons? Pakistan and India may not be friends but they would never use these weapons on the people and one obvious reason would be that they are neighbours and it would also affect the country using them in the first place. @Zak Do you even have any idea of the size of the Indian economy and its GDP , Worry about your economy and debt . Our economy is not dependent on the world bank and the IMF , We have our problems and we are working on them . @Zak from panama BTW China reserves are below 3 trillion and it is bleeding its reserves. In one month it lost 350 billion (more than India's total reserves). It is fighting a losing battle to protect its currency (in this case making sure it does not raise) and will definitely come under immense pressure when Trump becomes the POTUS. Trump may name it as 'currency manipulator' with ALL its consequences. Once the Chinese currency finds its true level, its exports to USA (main importer of Chinese goods) will become uncompetitive leaving the field open for countries like India, Pakistan and Mexico. @Zak from panama go educate yourself. @amarendra only in indian books. @Masoud , it will work more effectively on a country whose economy is 100% dependent on exports. Europe, America and major economies of Asia can cripple China and convert it into starved North Korea. ABC of economy!! @ANT if you ask people where they want to live, I can guarantee you that 101 out of the 100 people will choose Russia. It's a insult to human civilization that after 70 years of Independence, India still could not provide toilets to hundreds of millions of its citizens. At the same time, India is one of the top buyers of weapons in the world !!! My sympathy to the millions of India's poor. @PAK-OZ Emotionalism in what one says or listens can keep one away from facts. You are nice person rightly trying to remind America for not resolving these issues when in power. You have a moral stand while international politics is driven by what is suitable to a leadership in office and in line with their country's interest. It is difficult at this stage to know how Mr Trump's policies will unfold but he too will do what is best for America and pay no serious attention to issues elsewhere in the world which do not hurt them directly. We do not know he may be more disappointing to Pakistan, so to say that he would be better than Obama is bit premature. Have a good day! @Zak people do not read the contents of the U N resolutions but keep harping on it. please read the full resolution and understand the obligations. Use of nuclear weapons in Europe cannot be ruled out, with United States sending large contingents of troops all over Europe to increase its hegemony. Biden uses this language for South Asia when it is more appropriate for Europe. This is thanks to America's one sided China focused policies in the region, Mr. Biden with due respects.